Alfred North Whitehead is referring to the speculative leap. Having taken flight – ‘in the thin air of imaginative generalisation…’4 – and landed safely back on solid ground, he rationally interprets his findings in praise of the speculative method. Whitehead, who developed a non-anthropocentric philosophy that rejected the bifurcation of nature, and who has proved instrumental in the development of contemporary speculative philosophy, is a familiar place to start. 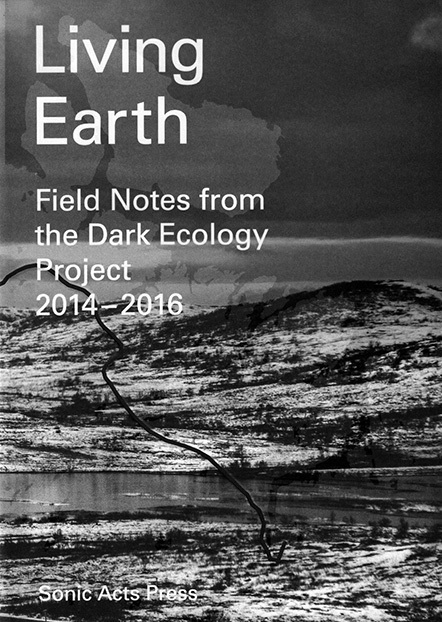 Certainly, contributors to Living Earth: Field Notes from the Dark Ecology Project 2014–2016 are no strangers to Whitehead – namely Timothy Morton who coined the term dark ecology and Graham Harman whose Object Oriented Ontology has been of great influence to many of the works documented within. Both theorists have been influenced and compared to Whitehead with varying degrees of suspicion and success.5 We have to start somewhere. If Whitehead stands behind us yelling ‘Jump!’ – Living Earth opens the darkness into which to leap. And Morton assures us that darkness can in fact be strangely light if we are willing to traverse its loops. So we begin in ‘darkness as depression’. But think not only of despondency. Think through a lowering of atmospheric pressure – a shifting weather pattern. Joris Strijbos’s weather reactive IsoScopes have been specially engineered for the plummeting temperatures of Kirkeness, Norway. A balloon attached to artist Signe Lidén’s backpack dips slightly with the wind’s perspective as he fires an arrow into the earth, recording each depression. Think alongside Tatjana Gorbachewskaja and Katya Larina through the economic depression of the nickel mining town of Nikel, Russia. And then descend, like Justin Bennett, into the deepest man-made hole on Earth in Murmansk Oblast, Russia. It goes on, thirty-three artists, philosophers, musicians and thinkers, commissioned as part of Sonic Acts’ three-year Dark Ecology art and research project reevaluating our relationship to the environment, hear the speculative philosopher’s call ‘…Jump!’ The result is an engagement with ‘aesthetics as first philosophy’ and acceptance of ‘the disturbing excess of the aesthetic dimension as an intrinsic part of everything in the universe…’6 – a collection of objects and experiences, pictures and sounds ‘…partly opaque or mysterious, as a surplus over and above its perceived qualities.’7 These field notes force us to think across scale – from ‘global weirding’8 to the fine stratification of the smallest anticline in the vast Barents Region, Russia. Start in darkness as depression; the loop of ecological awareness, in which we confront our coexistence with non-human forms deep within. In a Living Earth, darkness is constant – and light, darkness is strangely light. Darkness floats separating the parts from the whole. The precious metal and the unwanted tailings spread out in the darkness. The poisonous soup is a smearing of trace elements made into a liquid shimmer. Inseparable but distinguishable in their momentary disappearance into the darkness of one another’s shadows. Movement between places cannot be tracked by any single sense, any substance, in isolation. Seeing and hearing and feeling are a conglomerate sense – compatible with the seeping of sound and the shading of darkness as the two haunt one another – paradoxically present and absent as conglomerate weirdness in soupy darkness. Things are exactly as they are, but not exactly as they appear to be as they withdraw, the contextual abyss of explanation is foreclosed by an existence in darkness. 1. From the interview ‘Dark Ecology — Outside the Comfort Zone,’ Living Earth: Field Notes from the Dark Ecology Project 2014–2016 (Amsterdam: Sonic Acts Press, 2016), 11. 2. Timothy Morton, ‘What is Dark Ecology?,’ ibid., 49. 3. Alfred North Whitehead, Process and Reality: An Essay in Cosmology, corrected edition, ed. David Ray Griffin and Donald Sherburne (New York: The Free Press, 1978), 5. 5. See Steven Shaviro, ‘The Actual Volcano: Whitehead, Harman, and the Problem of Relations’ and Graham Harman, ‘Response to Shaviro,’ The Speculative Turn, ed. Levi Bryant, Nick Srnicek and Graham Harman, (Melbourne: re.press, 2011). 6. Timothy Morton, ‘What is Dark Ecology?,’ Living Earth, 51. 7. Graham Harman, ‘Magic Uexküll,’ ibid., 129. 8. Morton, ‘What is Dark Ecology?,’ 32. Sarah Jones is an artist, writer and curator. She is a PhD candidate with the University of New South Wales School of Art and Design. She was awarded her MFA from the Dutch Art Institute in 2015. Her practice explores publishing-as-process through the complicated materiality of text-based artworks. See further: www.sarahjones.net.au.